The keyboard is constructed of a metal frame with a revised QWERTY layout that's pre-programmed to speed up the most-used tools and features inside DaVinci Resolve. The keys are tiered and set on top of mechanical switches for a more tactile feel and although the keys and switches are rated for millions of clicks, each switch and key is user-replaceable in the event something breaks over time. A single USB-C port on the back of the board is used to connect it to its accompanying hardware, but Blackmagic Design has also included two additional USB 3.0 ports on the rear of the keyboard for additional accessories. The DaVinci Resolve Editor Keyboard also includes a search control dial that accurately scrubs through footage. When paired with the oversized in/out and source/timeline keys, the control dial makes it easy to cull through footage and get it its place faster than ever. Blackmagic has also included a dedicated numpad section for direct timecode entry. 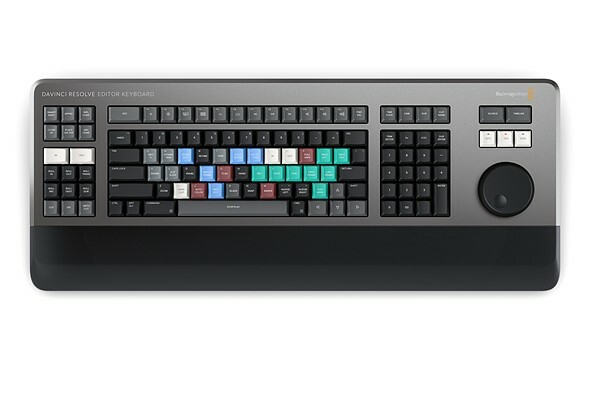 Blackmagic Design says the DaVinci Resolve Editor Keyboard is set to ship in August for $995 USD through authorized retailers. B&H currently has it available for pre-order, but it's priced at $1,025. To Blackmagic, you are not selling much at this price point, maybe a few dozen but that is it. Bunde it with the software and drop the price to 450, you will sell thousands. This is not free advise, you can send one unity as payment, thank you. I'm a bit of a keyboard nerd and I can tell you that "key switches are the same type used by eSports keyboards" is woefully inadequate information. Cherry? Topre? Romer? Tactile or linear? Weighting? Noise? C'mon, $1000 is big money even in the high-end keyboard world and no keyboard fan would spend a tenth that without knowing what actual switches they use. The special function layout resembles the key chart for Premiere Pro, accessed using CTL, OPT and CMD. Color coding is nice, but only necessary for members of Congress. Most of us don't even look at keys we use daily. A scroll wheel has very limited usage. There are keys for that, including frame-by-frame stepping. I use an Apple Smart Pad for scrolling, and a dozen other functions (my mouse is in a drawer, someplace). A track ball is much more useful for grading, and three track balls are even better (shadow/mid/high). Black Magic, Avid and others have more practical keyboards and consoles, but now we're talking real money. That said, the time saved and precision of results realized from a true work station quickly pays for itself if you do this professionally. A metal keyboard might be handy if dingos invade your tent at night. Wow. Interesting pricing. Leica making keyboards now? I learned CMX video editing in the early 90’s. Saw the Blackmagic keyboard and couldn’t help but think of the old CMX, keyboard and “gizmo” for scrolling to an exact frame. Don’t miss those days... check out the photo of old keyboard. Thousand for a keyboard, and the press pics are with an iMac ... is this the audience? Posing? What pro in their right mind would be editing on an iMac and then spend $1k on a keyboard? You could build a really fast Threadripper based Hackintosh (or better normal PC) for the combined cost that would save immense amounts of time due to being so much faster. The demonstration done by Grant Petty at NAB 2019 last Monday morning was done with an iMacPro which are around $6000 or more . Here is my photograph of Grant with that Keyboard. If you're in a post house, you're probably using a Mac of some sort. Every single non freelance position I have taken, Mac was the primary computer. When you work in IT it's just easier to fix a lot of Macs then it is to set everyone up with a windows system. I work IT for a post company and the problems on Mac are just so much easier to google. Well because that's what most of IT is haha. A top iMac SKU costs $6k now? What an absolute joke. You could build a far faster video editing system for $1200. People have lost their minds. Or you can just get the new iMac mini with an EGPU for $1800 or the new iMac for $2500. I am telling you that when you have an office of 50 people you can't build everyone a pc. You're going to be wasting all your time every time there's an update and something stops working. Only our online editor is on a PC and IT spends more time on his machine than any of our others. I personally have a PC at home but it just doesn't make sense for a whole office. Only for freelancers. I think you're relating a US experience. It's generally nothing like this in the rest of the world. Macs are seen as poorly specced, overpriced, very unreliable, and very unrepairable. Also, eGPU doesn't solve the CPU issue. @cameraobscurer Get lost with that nonsense. You're promoting people to use a non-supported version of MacOS, especially for professional work. SMH. Same old Apple-hating nonsense telling people they can get better for less if they avoid Macs. If you don't want to use a Mac, fine, but the rest of us prefer to use a real Mac without an unauthorized OS. Yeah cameraobscurer, I don't think you know what you're talking about. I mean the new iMac has an Intel Core I9 and the Mac Mini has a 6 core i7. I mean those are some really solid CPU's if you ask me. You really don't need much more. Also it is definitely not a US thing. I know both Canada and the UK are heavy mac users as well. I was just at NAB and from who I all talked to, even the P5 and EasyDCP guys who are based out of Germany use Mac. It's just so much better for office use. I don't know how you can make an argument that they're not. It's the result of having hardware and software that are so particularly integrated with each other. Like I am a PC user as I said, and for my personal use it's better but different systems work for different situations. A movie post and distribution house, is not one of those places where it makes sense to have a bunch of PCs. $1k for... A keyboard? Yeah, nobody's buying that. so, how others specialized keyboards etc for video cost? i guess they aren't 100 bucks, too. $1,025, thought this was time machine article on keyboard pricing from 2050. That price must be a typo. There has to be a decimal missing. 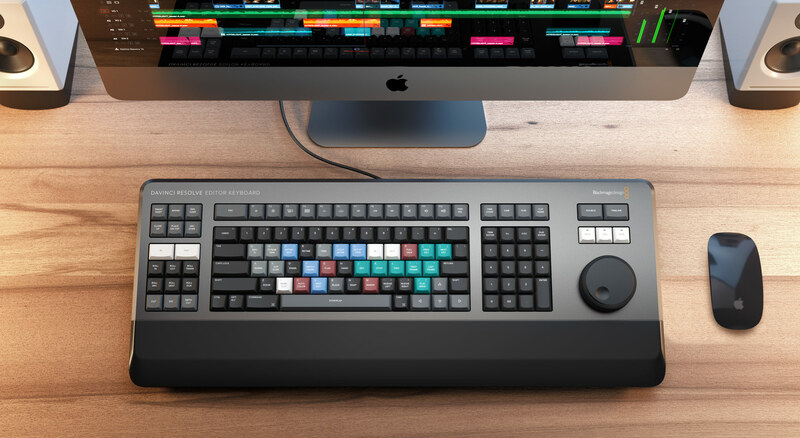 Please forgive my ignorance of video but am I right in thinking that this is just the keyboard and one needs to purchase the Black Magic editing software separately? My God..... It looks like an old CMX keyboard! I wonder if that big transport dial is spring loaded and automatically returns to center. "Please don't be $500, Please don't be $500"
for the "this is too expensive" crowd .. just dig around the custom keyboard builder forums. soon you will realise that a DIY of this type will cost you at least €500. without your time and without the custom molded cover. No, it won't cost €500 or more. You don't have to build a custom keyboard. Only modify a keyboard that costs less than €200 (label some keys or 3D-print them and run a custom software for it). $1025 for a keyboard is stupidly and unreasonably too much. You can buy the whole computer for that money, with a keyboard. While keyboard is just a keyboard, no matter how you program its keys, which is easy. There's plenty of free software to do it. i guess you need special driver and software, too. No special driver needed. The original one will do. Is this really the only keyboard with a wheel? I built my own set of 20 mechanical cherry mx macro keys for less than 30$ and they have more capabilities than this whole keyboard by far.... I wrote a chunk of code so I guess there was a lot more work involved, bust honestly 300$ for a custom built fully programmable keyboard built to your specs is about average. Some are more and some are less, especially depending on if you are the one building it. But 1000$ and it looks like this..... yeah not even partially worth it in any way. Just pay someone on Reddit $500 and you'll get more that you would ever need to want. Uf 1k$ is waaaay too much! I'm always try to customize shortcuts and use my old faithful Saitek Command Unit. After 12 years still the best left arm device. Unfortunately it is hard to get even used one. There are several alternatives like Logitech G13 and Nostromo spinoffs but they are ergonomically inferior and less customizable. BTW does anyone knows a company that could custom builds such devices? A Grand! ...... For a Keyboard ......... HAHAHAHA!!! just check the prices for post processing suite stuff! Even for a very nice mechanical keyboard with extra, specialized functionality, the markup seems insane. No way it costs even $300 per unit to produce. Probably a lot less. But there are many expenses in bringing a product to market, selling it and handling post-sale support / returns / BS / etc. Not to mention the age old marketing maxim of capturing the early adopters at an initially high price. This keyboard will, within the first year, find an equilibrium price probably under $500 which is where serious pros will look at the work flow gains and justify that lower price vs. a regular $100 keyboard. Why do you think they should pass the savings for their invention on to you? Where's the competition? Where's the market? Why is there always a post like this? They charge what they think they can make a good profit on. They don't charge what you think they should. I think this price is nothing for working professionals in big studios. After all, it's the studios paying for equipment. $1000 "hardware upgrade" happens all the time. Working professionals in big studios won't be looking at this. This is aimed at wannabe filmmakers and editors who think gear solves everything and are willing to dish out their YouTube revenue on gadgets like this. I disagree. I think this will go nicely with the existing Da Vinci console. Yeah Signumx this is definitely used by Pros. I don't know what you're talking about. This is suppose to accompany anyone using a tangent or larger board. It's a keyboard made for their cut and edit page. Some people like to have whole integrated systems, especially post houses. The more singular system you have, the less issues. That's why a big studio would use this. 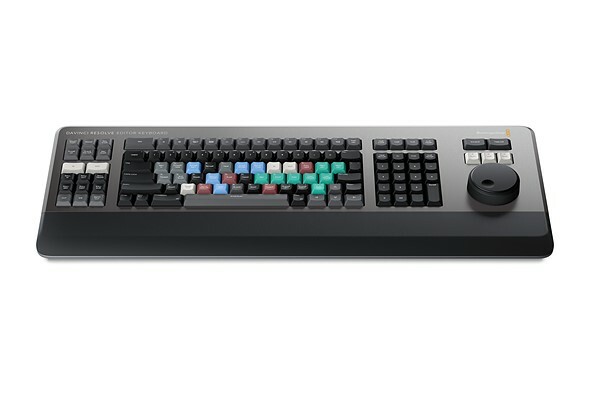 If you're already are using all Blackmagic, this keyboard is nothing in price and is a nice add on. A beautiful tool. Nice work BM. I would take a look at Loupedeck - a programmable console with buttons and knobs that works with LR. PS, Premier, and many other programs. $199. I use it mainly with LR and it’s a revelation - could never go back to mouse and sliders. Loupdeck is OK but far from perfect. Ergonomics are poor. This going by the description has much better build quality. Layout looks better. For a pro video editor this is not a great outlay considering what they have paid for the rest of their editing gear. What does, "ergonomics are poor" specifically mean? I was interested until I saw the ridiculous price. Before the qwerty 1 handed typists in the crew throw their teddies out the communal pram .... You could buy the full Resolve Studio Edit Advanced Panel ( think edit desk) for £25,000, or if it's not that serious the Mini Panelo £2790 ! Or if your out of here the Micro for £800 .... great with three rotary controls for grading . So in terms specialist edit control units £1000 is peanuts ! They're not really selling these, they're just here to make the Micro look like a bargain. What is so special about this keyboard? Even mechanical and capacitive keyboards are not that expansive and under $500. It seems this keyboard has mechanical switches but I really doubt about the price itself. It is a special thing with a smallish customer target. How can it not be expensive? There are a limited amount of people that find this totally worth the money. For them, the price is not a problem. I have a gamers board with mechanical switches for maybe $600. Nothing fancy - just a good board with red arrows instead of "wasd". But it is good, it is compact and worth it. And it will last forever. Even professional keyboards cost under $400. And you can customize keys and setup. Will you going to change every single keycap to change the setup? All I see is additional keys for Blackmagic. Nothing more. I see something to the right that you can rotate. And ... depending on the feel and accuracy of that thing, it has different costs. Moreover ... you cannot make such a board. So ... if you want one ... you either have to pay the price or wait until a cheap copy arrives, if ever. It is the same thing as an M Leica. You probably think it is over priced and would therefore never buy one. Still they are made, and sold. And I think Leica do just fine. because those that want one, and can afford it, cannot make one themselves. There is a keyboard just for Davinci Resolve and it cost only $150. Extra keys shouldn't cost $1000 just for a keyboard no matter how it made out of.